Welcome to our home on the Kohala Coast! We want you to feel the warmth, tranquility and love we have put in our "Luxury in Paradise" at "Waikoloa Beach Villas" for you to enjoy. 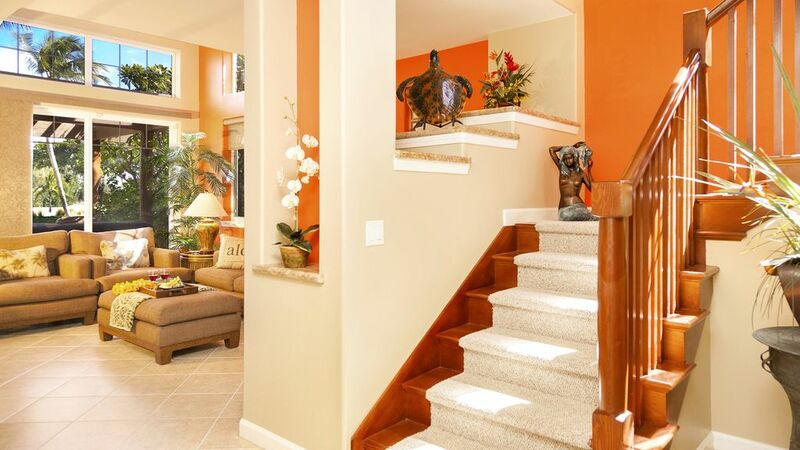 The best of the Big Island is yours at this 3-bedroom, 3 bathroom vacation rental townhouse in Waikoloa Beach Resort! Boasting over 1,700 square feet and comfortably sleeping up to 8 guests, this exquisite home features 2 lanais, a spacious lawn area, outdoor kitchen, and high-end finishings throughout. You'll love staying in Waikoloa Beach Villas at Waikoloa Beach Resort with access to two community pools, two hot tubs, and a fitness center. You'll never want to leave this tropical paradise! Wake up with a gourmet cup of coffee, let your hair down and take a stroll towards the beach or walk across the street and grab a coffee at Starbuck's. Let the sun revive your skin and leave behind all your concerns; and allow your heart to beat with the rhythm of the waves. What a way to start your day! Spend quality time with your loved ones, put your watches away and let the environment guide you by choosing among hundreds of things to do on the Big Island: From snorkeling, diving, shopping, dining, and of course, FISHING! As many consider this to be "Marlin Capital of the World". Book a tee time and play a round of golf at the King's Course and/or the Beach Course within Waikoloa Beach Resort. Enjoy your Unlimited Reduced Golf Fees of $50 - $75.00 a round at both courses. I am a California Licensed Realtor. Our villa, Gaddie Condo, is looked after by a local representative that lives close to the resort available for you to contact during your stay should the need arise. You will be provided with their information upon arrival. You can also give us a call anytime. *Fee based Concierge Services are available; inquire if interested i.e. in condo massage, grocery shopping, activities & excursions. Michael and I live in South Orange County. I am a California native. Michael was born and raised in Memphis, Tennessee. We are now empty nesters. Our two sons, Austin, and Clayton are both students at USC. Michael is a business consultant specializing in construction management and has been on the AOAO at Waikoloa Beach Villas since 2010. I have been in Real Estate since 2001 and am also an executive distributor with Young Living. We love the Big Island and visit 2-3 times each year. Come and visit the Big Island. We would love to share our little piece of paradise with you. After looking at different communities on the Kohala Coast we chose to purchase this town home at Waikoloa Beach Villas because of its location to the many amenities within Waikoloa Beach Resort. We were also attracted to the low density within our community (only 120 condos), the two beautiful resort style pools, and the beautifully landscaped grounds. We especially like being within walking distance to both the Queens and Kings Marketplaces home to high end restaurants, shopping, Starbucks and local entertainment. After walking into this private end unit next to a large open breezeway we new we found our home-away-from-home. Born an island of both fire and ice, where land and sea meet in one of Earth's most epic battles, is where we discover the Big Island of Hawaii towering above the crashing waves. Home to two of the world's greatest mountains, one of the world's most active volcanoes, 11 of the world's 13 climate zones, Hawaii's greatest king, and the wettest city in the United States (HILO), the Big Island of Hawaii is an island like no other. It is an island of such proportions that all of the other islands in the main Hawaiian chain could fit inside it twice. Sitting in the middle of the Pacific Ocean, the landmass of the Big Island is approximately the same size as the state of Connecticut, about 4,050 square miles, and is still growing daily thanks to Kilauea Volcano on the eastern coast of the island. Waikoloa Beach Resort is located on the Kohala Coast with ideal weather year round with average temperatures in the 80's. The best beaches on the island, beautiful Hapuna and Kauna'oa beaches are an easy 10 minute drive away. This upscale community has something for everybody! Sights to visit - distances by car: A-Bay beach (1 minute) Waikoloa Hilton (2 minutes) Hapuna and Mauna Kea beaches (10 minutes) Kona airport (20 minutes) Kona town (30 minutes) Hawi (35 minutes) Waimea (45 minutes) Captain Cook's monument (40 minutes) Hilo (1.5 hours) Volcano National Park (2 hours) Big Island is a short 5 hour flight from LAX. Located on the 3rd fairway of The Beach Golf Course. View of the Beach Golf Course from living room, kitchen, master bedroom, downstairs lanai and master bedroom balcony. Free local and long distance calls within the U.S.
Bedding for all beds and sofa bed. One single car garage with beach chairs, umbrellas, boogie boards, snorkel gear and sand toys. Additional parking available. A small fitness room by the west pool. Fully stocked kitchen indoors and an outdoor kitchen with granite counter tops, sink, new cabinets and a Viking grill. Comfortable seating for 6 with additional seating for 4 at the kitchen bar; along with outdoor dining table. Private Shaded Balcony off of Master Bedroom overlooks the beach golf course. Waikoloa Beach Villas J4 includes Waikoloa Beach Resort Gold Membership Golf benefits at the Waikoloa Beach Resort Kings' & Beach Courses. Fees are $50 -$75.00 per person, per round; unlimited golf. Limited accessibility The entryway is on the ground floor with no steps. There is one bedroom, one bathroom, kitchen, dining room, and family room on the ground floor. Two bedroom, two bathrooms, and loft are upstairs. Downstairs Bathroom does not have a walk in shower. We regret our home has limited handicap accessibility. Less than a minute walk from our front door. We start our guests with amenities for bathrooms, laundry and kitchen. We also provide guests with Kona coffee and bottled water to start their vacation with. My wife and I just stayed at this lovely Waikoloa Beach Resort home with our 3 children (ages 7 through 12) for the kids' Spring Break. The house is marvelous, with great outdoor seating and very comfortable bedrooms and interior living spaces. The surrounding property and grounds are simply spectacular in vegetation and greenery. There were plenty of beach supplies in the garage for us to use, and so many activities are within walking distance or just a short car ride away. The property is across from the Queens and Kings Marketplaces, which gave us walking access to lots of great restaurants and shops. The Island Gourmet is a great market to get food, alcohol, and common drugstore supplies (like Tylenol and sunscreen). Some of our favorite local spots included Lava Lava Beach Club, the Luau at the Hilton, Daylight Mind Cafe for breakfast, Kamuela Provision Company restaurant for a fancy dinner on the waterfront, Foster's Kitchen (best fish tacos I have ever had! ), On The Rocks for a casual dinner watching the sunset and listening to live music in Kailua/Kona, and for a quick delicious local bite we loved Ippy's Hawaiian "Barbeque". We hiked the majestic Pololu Trail down to a black sand beach near Hawi, did the Flumin Kahola kayak ride, kayaked and snorkeled Kealakekua BayI had to ask Michelle (the owner) a quick question and I was able to reach her on her cell phone promptly. She was easy to communicate with via email, the VRBO website, and by cell phone. The pictures shown of the house are true to the real thing, one really has to see and stay at the house to fully appreciate it! We have been to Hawaii many times, and this was the best house we have stayed at on the islands. We were very sad to depart, but we have left with many fond memories. We spent 19 nights at this condo over spring break. Location is amazing within walking distance to shopping, dinner and to watch the beautiful sunsets at A Bay. Been renting on VRBO for years and have never had a condo as well stocked as this one. Condo is beautiful finished with an amazing lanai with a gold course view. The BBQ was top notch and we cooked fresh caught seafood from Da Fish house up the road most evenings. Owner was great in providing check in details well in advance and was very accommodating leading up to our stay. You can tell the owners have put a lot of love into this unit and you really feel warm and welcomed in this condo. In my mind, this is the best loctaion within the complex, close to both pools and the front gate when walking. We would come back to this rental in a heart beat. All you would want for the beach is in the garage. Private gas bbq with plenty of gas. Guide book, books to read, games. Anything you might need for a vacation stay. Clean, organized and beautifully appointed! This is a very nice well maintained and well equipped unit and also very clean. We enjoyed a family Christmas here and liked the location a lot as well. It’s quiet but close to lots of conveniences and in easy walking distance to A Beach. I would recommend it. This is a very nice unit. It is well maintained and very clean as well. It is well equipped both in terms of the kitchen and linens, and also has lots of beach/water equipment available for use. The exterior seating, dining and grilling space is also good. It is located in a quiet area but close to conveniences, and also a good location to base out of for island sightseeing. We enjoyed a family Christmas gathering here and the place worked out very well for us. I would definitely stay here again. Waikoloa Beach Resort is made up of two hotels, two shopping complexes, two golf courses, and 8 condominium complexes. Each of which are separate entities and do not share services. Guests of our unit get discounted golf rates at both resort golf courses. Nightly rates subject to 14.41% Hawaii State taxes, Cleaning Fee, Refundable Security Deposit, and Administrative Fee. We require 50% at booking and balance 60 days prior to your arrival date. Our rates are subject to change and may be higher for certain times of the year. Minimum stays may be longer for certain times of the year.